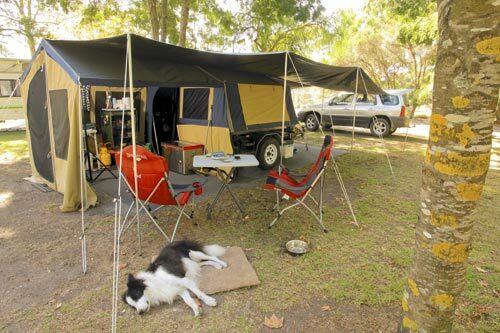 This may come as a surprise, but not everyone can afford a $40,000, $30,000, $20,000 or even a $10,000 camper trailer. I am one of those people. So is my wife Margaret, but only because she follows me and doesn’t always look where she’s going. At this point in my life — 67 going on 17 — I find myself with fewer resources than befit a man of my stature. I don’t want to be rich, I just don’t want to be poor and it seems I’m perpetually suspended between the two. 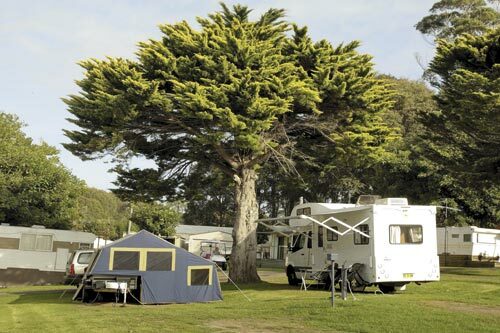 Anyway, I was pondering this mystery (and others) one afternoon when Margy suggested it would be nice to own a camper trailer and go wherever we pleased, whenever it suited us. She was perfectly correct; after all, ‘it all’ has always seemed to me a worthy thing to escape from. Unfortunately though, right then and there our resources were limited by the simultaneous need for another car, on account of our Commodore falling to pieces in the driveway after 400,000 difficult kilometres. 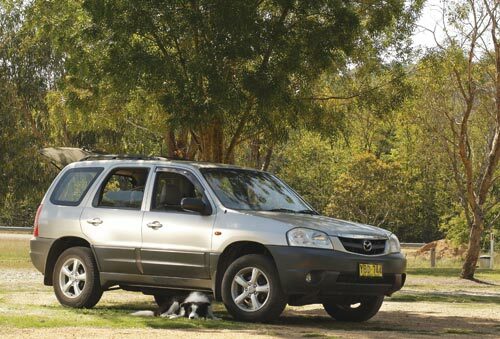 In the harsh light of reality, we figured the most we could spend on a brand-new-second-hand car and a camper trailer amounted to the staggering sum of $13,000. Or thereabouts. ‘Thereabouts’ is a loose term, and rational decision-making has never been my strong point. With those two things in mind, I rang the bank manager and gave him the good news that we’d allow him to donate $13,000 at 6.64 per cent, thereby extending our debt to the bank by several zeroes. Not to worry though — it was all for a good cause. 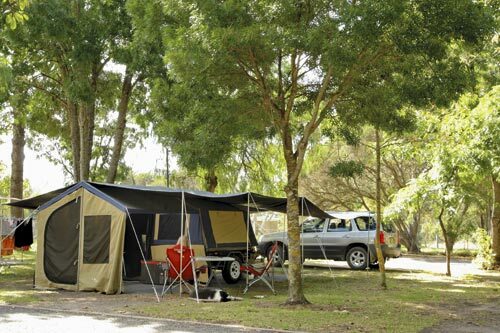 Buying a camper trailer is easier when you don’t have much money and all you really want is a good camper unit on a well-made 6x4ft box trailer with a few extra doo-dads. With lower expectations, you don’t have to worry about which one has the best kitchen layout (because they don’t have kitchens) or the nicest internal trim (who can afford trim? ), or whether the pop-top pops enough, or the softfloor is soft enough, or the suspension is suspended so expertly you’ll never feel a thing, even in a boulder field. We didn’t want any of the posh gear — we simply couldn’t afford it — but we did spend a lot of time looking for a well-made camper. I surfed the internet every night to suss out the options, until one evening a mate of mine in Tassie, landscape photographer Dennis Harding, told me about his own cross-country spaceship comprising a Oztrail Camper 6 tent and a locally-built 6x4ft box trailer. The whole fruitcake cost him five grand, he said. 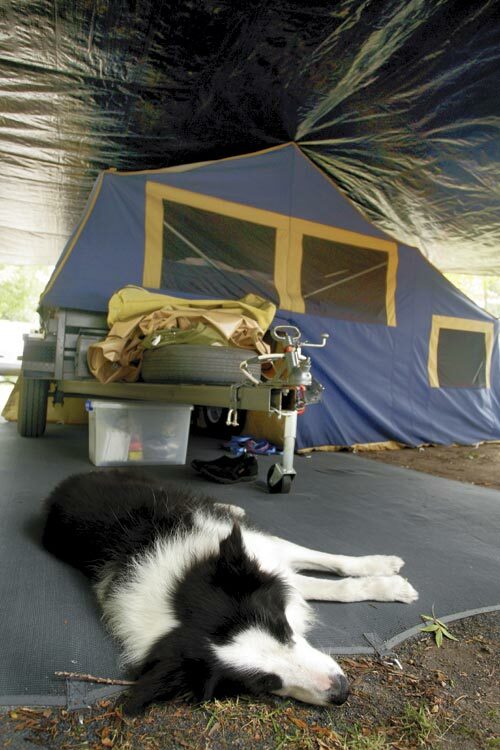 The tent has never leaked “even in thundering rain”, wind doesn’t bother it if he pegs it down properly, the double bed is easily big enough for two people, and comfortable to boot. With a few minor additions, like a 240V inlet plug, a bench on the tailgate and a home-made set of drawers inside the trailer, this vehicle, said Dennis, had enabled him and his wife Barbara to chase landscape photos all over Tasmania in what they consider to be relative comfort. Knowing Dennis is a cautious and careful man (and more importantly, frugal), Margy and I went out and bought the Oztrail Camper 7 tent. Well, not just like that; we surfed the web for another week, looking for good buys in top nick, and finally found one on eBay, mounted on a sturdy, locally-built Holiday trailer. Spending $2700 on a camper on eBay, sight unseen, felt a little weird, but again I acted as if nothing could possibly go wrong and luckily for me, it didn’t. The camper was owned by a very nice bloke in Wollongong (NSW) and had, apparently, never been used. So, I started bidding on it. I never thought I’d win but for some reason the bidding dropped off. Suddenly Margy and I had less space in the carport, right in front of the brand-new-second-hand Mazda Tribute and the 10-year-old Stihl whipper-snipper that barks like a seal. I worried about the money I’d spent, but the worrying didn’t last. After a minute or so, I thought: stuff it. We’re getting older and we’re not gunna live forever. We might’ve screwed the pooch financially but what the hell, let’s get out there and do it! The first trip we undertook was a casual two week dawdle from our home on Lake Macquarie (near Newcastle, NSW) first to Narooma on the South Coast, then to Khancoban in the Snowy Mountains, before swinging by Eden on the way home. We’re equipped to do it but we’re not into ‘free-camping’ in remote places, so mostly we worked our way from one caravan park to the next. But only if they were dog friendly; if we’d left our 12-year-old border collie Bill at home it’d break his heart. And mine. It took us a couple of put-ups and take-downs before we got the hang of how to erect this camper properly. There’s a kind of rhythm to it, if you know what I mean, and if we get the sequence nailed we can have it up and pegged out in about 10 minutes. I was always worried what heavy rain would do to the camper material but so far it hasn’t hurt anything. In Khancoban we enjoyed a very florid demonstration of what angry mountain weather look likes before it dumps on you. It came down by the truckload, but the Oztrail 7 never let a drop of water in anywhere. I was still a bit tetchy about it though, so next day, when the whole thing had dried out, I put up the 7.5x5.4m tarp we’d bought at the Narooma Mitre 10 for $140. It’s one of the best purchases I ever made. This thing not only covers the entire camper but gives us heaps of extra storage space on either side and a whopping three metres or so out the back. There’s so much room out there I can park the car under it if the rain looks like aggregating into hail. While we’re on that subject, there are three things you should know about tarps: 1) heavy rain makes a thunderous cacophony when it hits one, it’s like sleeping under a sheet of corrugated iron in a monsoon; 2) if it does rain hard you can lower the tarp at the sides, which prevents rain pooling on the top; 3) tarps require support — I now own more adjustable tent poles than anyone in the Southern Hemisphere. There are some aspects of extended camper trailering we’re still working out. For instance, the small 12V fridge we started out with couldn’t store the amount of food we were carrying. We called in to Barbecues Galore in Bega and bought a big 240/12V Primus fridge/freezer. We run it at 5ºC, and it works a treat, but if we run it any colder it freezes everything. Like I said, we’re learning as we go. Also, we haven’t found a workable table arrangement yet, but in the interest of making things easier for Margy, I think I’ll ask Krispy Nixon to make up a bench for the tailgate, with a few drawers under it to stash the two-burner cooker and a few odds and sods. Dennis Harding made up a sliding box in the rear of his trailer behind the tailgate, and into this he installed a set of Bunnings drawers for plates, cutlery, cooking ingredients and so on. I think I’ll do that too, so everything’s always in the same place and Margy can quickly find what she needs. Readers of this mag have suggested vacuum packing food saves space in the freezer, so we’re investigating that as well. In this business, anything you can do to save space is worth the extra effort. My next job at the other end of the armada is to get the Tribute wired to charge the Primus while it’s plugged into the fag lighter. Then I won’t have to worry about how much power I’m dragging out of the car battery. We still have a few bugs to flatten, as you can see, but I gotta tell ya, we love our camper trailer and can’t wait to get out there again and see the world at our leisure. If we were staying in $100-a-night hotels instead of caravan parks it’d chew up $2700 real quick and we’d have no hope of doing any of this. I like to think the pleasure we get from our camper trailer validates all the decisions I made at the start of this caper, but maybe that’s taking it a bit too far. Find used campers for sale.